What Do The Colors And Symbols Of The Flag Of Namibia Mean? Namibia’s Constituent Assembly adopted the final design of the flag on February 2, 1990. The official flag of Namibia. The southern African nation of Namibia was inhabited since ancient times by a number of groups like the Damara, Nama, and the San peoples. During the period of Bantu expansion, the Bantu peoples started immigrating to the country. Today, the Bantu groups dominate Namibia’s population. In the 19th-century, some regions of Namibia became part of a British colony. In 1884, Germans captured large parts of Namibia. After the First World War, Namibia came under the rule of the UK as directed by the League of Nations. The administration in Namibia was then run by South Africa which was also a British colony. Apartheid was soon applied here. 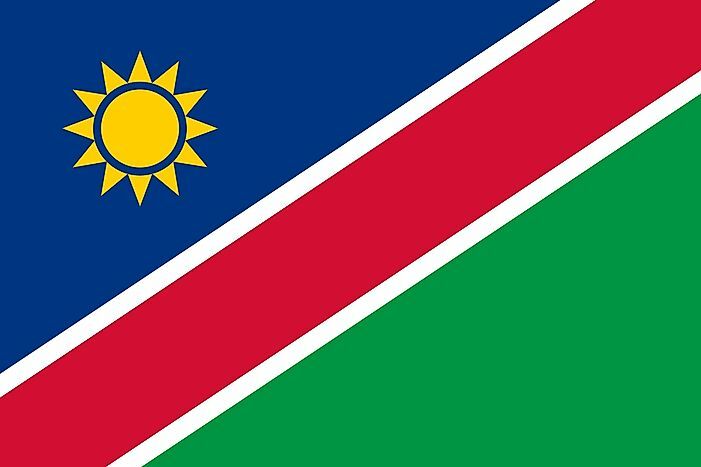 The independent country of Namibia was born only recently after years of struggle for independence against the South African rule. In 1990, Namibia became a fully independent nation. Today, it hosts about 2.6 million people and is one of the world’s least densely populated regions due to the presence of the massive Namib Desert. The design of the national flag was chosen by the National Symbols Sub-Committee of Namibia. 870 entries for the design of flag were carefully examined and six were short-listed. Finally, three designs were selected from the six chosen entries and were combined to form Namibia’s national flag. The winning designs were created by three Namibians - Don Stevenson, Ortrud Clay, and Theo Jankowski. Namibia’s Constituent Assembly adopted the final design of the flag on February 2, 1990. On March 9, 1990, the flag was unveiled and the three designers were publicly acknowledged by the flag selection committees chairperson. The flag of Namibia features two triangles that are separated by a diagonal band in the between them. The upper triangle is blue in color and the lower one is green. The diagonal band between them is red and is bordered by white. It runs from the lower hoist-side corner to the opposite corner of the flag. The upper triangle has a gold sun with 12 triangular rays radiating from all sides. The colors and symbols of the flag all have their own meanings. The blue color is a symbol of the sky and the ocean both of which play a vital role in the country’s well-being. The red color represents the people of the country, their courage and determination to achieve equal opportunity for all in the future. White in the flag symbolizes unity and peace. The country’s agricultural wealth and vegetation are represented by the green color.